I am so happy that my contributor CP Choong is back with more sinfully delicious baking recipes. In this post, she is sharing an utterly gorgeous, rich, buttery, and decadent Brownie Butter Cake recipe, adapted from Kevin Chai’s “I love Butter Cake Too 2” cookbook. CP Choong and I went to high school together, but we didn’t know each other when we were in high school. Our high school is the most famous Chinese girls school in Penang, attended by hundreds of students in each grade. Fast forward to present time, CP and I finally met, through a mutual good friend, when I was back in Penang earlier this year. I am just so happy that she is now my contributor and I can share her wonderful baking recipes with you. She is an excellent baker and also a very talented photographer. I absolutely love her food photography and her baked goods are truly top-notch. If you read this blog, you will know that I love butter cake and my family really enjoys butter cake with coffee. So, you can clearly see why I am partial to this brownie butter cake—it’s butter cake, but better, because there is brownie at the bottom of the butter cake. Just look at the photos, I am sure you can smell the buttery and rich chocolate aroma from the screen. Put simply, this brownie butter cake is simply brilliant and irresistible. This recipe calls for double baking: first, you bake the brownie, and then the butter cake that goes on top. However, the time invested is well worth it when you sink your teeth into the rich, buttery, warm, chocolate-y brownie butter cake. Brownie butter cake - thick brownie and rich butter cake combined into one decadent and to-die-for cake! Click for recipe. Grease and line a 10cm x 20cm (4x8-in) loaf pan with aluminium foil. I am using allrecipes.com conversion chart. For the best results, please follow the metrics measurement. I mixed the butter cake batter while baking the brownie. Then I poured the butter cake batter VERY QUICKLY onto the "hot" brownie. The butter cake batter will melt instantly. The second time I baked this brownie butter cake, I put the butter cake batter into a piping bag and cut a big hole at the tip, pipe in the butter cake batter quickly, and just shake and tap the pan to smooth the top. I’m definitely going to make this soon. Have all the ingredients and seems super easy. can I use fine sugar instead of brown sugar? I tried baking once, it was a failure. I am going to give it a go again. 4 x 8 pan way too small. Ends were done perfectly, but when I cut toward the middle all of the butter cake batter ran out uncooked. Had to throw it away. May try again in larger pan as the ends that were done were very tasty. You have to insert a cake tester in the middle before you take out from the oven. If the middle of the cake is runny and not cooked, bake longer. Could I use coco powder instead of melting the chocolate? I was wondering the same as Tawny. If we could use the cocoa powder instead of melting chocolate? I made this it was perfect and a very elegant cake. Will make it again soon. Followed recipe exactly with no problems? Thanks Gale for trying the brownie butter cake recipe. You need to bake it longer every oven is different, some is even heating, some top down, some from the side. Cover the top with aluminum foil to prevent burning. I can’t find the instructions.? ? I baked the brownie butter cake twice and all turn out well but the butter portion texture is compact? Why is it so – is it suppose to be soft and spongy? Pls let me know as I like this cake very much. Thank you. NO, it’s not supposed to be soft and spongy. When I make mine, I will pour some ganache over top. Should make for a nice tasty chocolate flavour. Bee, is the butter cake batter poured on the hot/very warm brownie or on cooled brownie? I noticed that the butter cake batter is made after the brownie was removed from the oven. Can we mix the butter cake batter while the brownie is in the oven? Please advise. Yes I checked with the contributor and she said yes, just do it very quickly. Please refer to the Cook’s Note and also Angela’s comments below. I haven’t seen a brownie cake before. This looks amazing! I am with you Tuty. Cake looks really good but instructions a bit poor because not everyone can bake. I spread my butter cake batter on almost immediately after removing the brownie from the oven. It’s still in oven baking and I hope it will turn out ok. I have a feeling that the brownie has to cool off first so both batter is the same temperature. If not the brownie will cook way too much before the butter cake is cooked. Well…hindsight is good but may be too late for my cake! LOL! This cake looks awesome and i can’t wait to give it a try. Kind of like a black and white cookie but in cake form. Glad you met up with your friend again! I am going to bake it this weekend, it will be nice if the size of the baking tin is mention in the receipe. Hi Lynn, yes, the size of the baking tin is in the first line of the method. The cake looks fabulous..wanna give it a try soon..
Hi Bee. I just finished baking this cake. What can i say??? Its outta this world. It looked just too pretty to be eaten…n it tasted equally fantastic. Mine looked exactly the same as urs in the picture. Can’t thank you enuff for this recipe. Grease and line or line and grease. It seems to me you would line the pan first. Regarding the “grease and line the pan,” it’s the exact words from the cookbook. If you are using parchment paper, we have to “Grease and line the pan”, so that the paper can adhere to the pan and remove easily. Whereas if you line the pan with aluminium foil, we can just “line and grease the pan,” make sense. In this case, parchment paper is used. When you melt chocolate and butter, do you melt them separately or together. And when you say ‘melt’ you mean, use the double boiler system right? I’m new to baking so I get a lil confused when the instructions are vague. Hope you can help me out here. Melt butter AND chocolate on low heat on stovetop. Hi Bee, I seldom bake. Can I know how many eggs to be used for the brownie part and how many eggs for the butter batter? Really really good! This was very easy to make and absolutely delish! Just cooked 10mins longer because it was not done in 35mins. Must be my oven though! I had to try this today, no it could not wait till tomorrow. I did make a couple changes as I am prediabetic and do not use white sugar. I still used brown sugar in the brownie part though. Ok, so I am not perfect. I did not have chocolate squares on hand so I used unsweetened cocoa powder and put some Baking Splenda into it. Brownie part was perfect. As for the butter cake part, I used Baking Splenda again instead of sugar and I used cholesterol free carton eggs. it came out a bit denser than i like as I slipped and used too much egg. But the taste is great. The only other thing that was different is that without sugar, it was not as golden brown as it would with real sugar, but that is ok with me. All in all it is a hit. Thank you. I now have a new go-to dessert. I just finished my 3rd piece. After all, I have to make sure it was good enough for the spouse to taste. I know I’m a bit late to the party so to speak, but I just saw this on Pinterest… You mnention being pre-diabetic… may I suggest you try substituting “coconut sugar” for part or all of the sugar. I think you will be pleased with the results and it is found to actually be helpful for diabetics. THere’s a lot of good articles on the web about diabetics and the use of coconut sugar. IN a recipe it taste amazing. Is the brownie supposed to be crumbly? I believe that means there is not enough fat or the brownie was over-baked. I’m trying this recipe as I write and will give more feedback after it’s done. Fingers crossed! I just baked and waiting for it to cool down. I have the same problem, my brownie is abit crumby n the brownie n butter seems labor like 2 separate layer instead of 1 joined cake. Well, , I m still a novice to cake baking so will try again. Just made this last night and followed the directions without any problems. I have to say its gotta be one of my top 5 best baking desserts I’ve ever made. Tasted like I bought it from some gourmet bake shop! Thanks again to you and your contributor. It’s a brilliant recipe! What kind of dark chocolate do you use? Is it a baking unsweetened chocolate? Can’t wait to make the cake. Hi Bee, when it comes to butter, I always wonder what is the best way to get the measurement right. Eg 120g or 1/2 cup, do I need an electronic weighing machine? Or melt the butter to get the grams or just pure estimation from a block of butter? Weight in block for 120 g or melt first and then measure for 1/2 cup (American measuring cup). I’ve been following you for sometime and this is my very first time leaving you with a comment, which i feel i have to say a BIG THANK YOU for all the wonderful recipes… I’ve tried this brownie butter cake and it turns out excellent!! my cake doesn’t cracks too!! :) I’ve used a round tin (non stick) and also added almond nibs to my brownie and a tsp of vanilla extract to my cake, it’s perfect i say… Keep posting on great recipes!! Cheers..
i just finished baked, but why the butter cake & brownie come out very wetly, why? I don’t have sweet tooth but your cakes look yummy and I wanna try out your recipes. If I reduce the amount of sugar by half, will this affect the texture of the cakes or cookies? How about adding canned pumpkin to the butter cake for Thanksgiving? Would the ingredients have to be modified? I am planning to do a pumpkin bread recipe soon. Stay tuned. Did you use hand mixer to mix the ingridients? Thanks! i still wished you can bake on a video and show us – i’m no baker – i tell yer. Hi Bee, I really want to try this out, but I am allergic to Gluten, so I can’t use normal flour. If I were to use the Gluten-Free flour, would it be the same measurement? I don’t know why, the butter part came out perfectly (yay!!) but the brownie was crumbled and bitter :| The brownie should be soft right…? No it’s not supposed to be hard, but soft and densed. This butter cake looks delicious and oh so moist, what a treat! Is the brownie bit of the cake heavy? I am wondering about the chocolate used. I have unsweetened chocolate in my pantry. Is that what you used? The best is dark chocolate so you’re OK. However you can also use sweetened chocolate. Can you please let me know if the mentioned oven temperature is for FAN or normal oven. My oven is fan assisted so i reduced the temperature by about 10 degrees. Hoping it will turn out good. Thanks. Thanks for the wonderful recipe.Just baked ’em yesterday,and it came out purrrrfecccttt.My hubby and daughter just loved it.Perfect for a snowy day. Hi Bee, I have just baked this cake. Just wondering why the top part of my cake is not brownish like yours? Mine is yellowish top and no crack. I checked the cake and is cooked. I noticed the cake was sweating on the top part when I took it out from the oven, and then it dried off quickly, is this due to using aluminum foil to bake? Hi Shun, maybe, I am not sure. You might need to bake longer to get the top browned, even though it’s cooked you can baked slightly longer to get to the coor you like. I too was super excited to make this. However, I too had pale results. I think it is the low baking temp. Most of the pound cake (butter cakes) that I have made are baked at 350F. I would suggest baking at a higher temp to achieve the browning and then reduce the heat. Otherwise just leaving it at 350F. Curious to see how this tastes! I am drooling over the combination and look of this cake. I am gonna try this soon and post on my blog with due credit to you and your hardwork …. I’m planning on doubling the recipe for an 8×8 pan. Hope it works! Done baking :) Thank you for the recipe! If i want to store it, to be presented in 2 days, do i keep it out, or chill it in the fridge? Is it ok to replace the dark choc with cocoa powder? Hi! Thanks for the recipe. I’ve just baked it, meant for the kids’ weekly lunch pack.. But half of it is gone by now! That means the kids and my parents (who are pretty picky eaters) love it! I, on the other hand, am in love with the butter cake. Do you think if I double the ingredients for the butter cake, it could turn up well too (just the butter cake, minus the brownie)? My options at the grocery store for Chocolate are; Bittersweet, Semi-sweet or Unsweetened. Which do you think would be the best choice? Can this be baked in a square or round tin? If yes, what size? Thanks!! Tried the recipe today…and it looks and tastes yummy..!!!!!!!! Hi there! Just thinking, the brownie won’t get burnt? I mean its like a double bake for the brownie right? No, just follow the recipe. I do not have a loaf pan. Can you please suggest an alternative to it.. May be a springform round pan?? You should specify what kind of dark chocolate, I used unsweetened cacao and the brownie part is very bitter. I think is recipe intended sweetened chocolate. Unsweetened chocolate IS bitter and nowhere in the recipe does it even mention “unsweetened chocolate”…some people! Anyway, I never leave reviews but this deserves one. Made this exactly as directed and it was just divine..seriously! Goes great with coffee or a cold glass of milk. Used dark chocolate chips for the brownie part, and I will probably add some vanilla extract to the butter cake mixture next time…cause there will many more. Thanks for such a great recipe! I made this tonight with little success.I followed the recipe to the T..but the brownie completely fell apart when I took it out of the pan, tha cake baked perfectly but tasted very to much like flour..my husband had a pies at told me to throw the rest away! I never have bad luck banking so what went wrong!!? I don’t know what happened many people tried this Brownie Butter Cake recipe with success and no issues with it. Do you think this can be done with a brownie mix and cake mix and still turn out the same way? Maybe but…it’s best you follow this recipe. Why do you line the pan with foil? i put brownie mix in tin then the cake mix carefully and cooked both together at same time took longer to cook but both very moist yum! which flour yields the best texture? I saw the cake in this picture has a very fine and compact texture. is it ok to use your own recipe for the brownies and use a store bought cake but still follow the instructions for baking the brownie / cake? I haven’t tried that I am not sure. You tube for brownies butter cake pls. I had tried baking this yummy cake but my butter cake doesn’t stick to the brownish cake. When i cut it, they’re two separate cakes. Can I know what’s the reason? Hi,I am new to baking and I would like to know should I use salted or unsalted butter for this lovely cake. Appreciate your advice. Thank you. Unsalted butter but salted butter is OK, too. I tried this recipe, but substitute dark chocolate with Hershey’s chocolate chips. Very nice! Thanks. Hi. Baking brownie 15 mins earlier and then again for 35-40 mins with butter cake? Wont the brownie become over-baked?? Please clarify. Just follow the instructions, it works. If I bake it in a tin foil pan, do I still have to line that pan with tin foil? can you make this a round or square pan if so what size? I plan on making this, this evening, but all I have are 5×9 loaf pans – should I simply shorten the cooking time? Any experience cooking in this size pan? Thanks! Not sure just test the doneness with a cake tester. I was wondering if you could use milk chocolate for the recipie instead of dark chocolate? For best results please use dark chocolate. Hi Bee, this is a FABULOUS recipe…….thanks for sharing..My 5 kids love this cake so much so that i’ve tried making my own versions just with this basic recipe. I’ve tried replacing the dark chocolate with white chocolate or milk chocolate with reduced sugar and they all turned out well. I even added banana to the brownie and tried changing butter cake to chocolate cake and it still worked well for me……Can’ t wait to experiment with other flavors……. My loaf is 10×24 cm later the brownie batter will become thin. Any advice so i dont buy need loaf. Thank yoi. Hello! Another person who found your recipe via Pinterest. I’m no expert baker but I managed to follow your recipe with no problems, I loved the result! I used 80% dark chocolate for the brownie, some may find it strong but I don’t like my cake too taste too sweet if that makes sense! I also mixed both batters and then put brownie layer in oven, that way I could pour sponge batter on the brownie straight away and return to oven immediately. The timings were just right for my oven too. Hope this feedback helps. Thank you for your formula. Could I ask you a question? I didn’t know my brownie cake layer shrinks compared with butter crusts after getting from the mold and let it cool? Please kindly help me on this. E recipe was juz awesome. Moist and dense cake. Luv it. I was very excited to try this cake! Unfortunately I must have done something wrong. The whole cake was very dense, almost soggy, and not cake-y at all. I also had to leave it in at least 20 minutes longer because it wasn’t done. I’ll give it another try soon, hopefully it will turn out better! I think I might try a little bit more baking powder I made your butter cake recently and it turned out perfect! To those who are having trouble with either portion of the cake, the key is in the flour. Years of baking has taught me to weigh my flour, not measure. When we measure, we tend to pack it into the cup, where as a weight is more of an accurate measurement. My scale has a bowl specifically for weighing “loose” ingredients. If your scale doesn’t have a bowl, first you must “tare” your scale to account for the weight of the bowl, then start adding in the flour. Be sure your scale does weigh food to less than 1 gram though, it makes for getting the best results. Metric to American measurements have a slight variance that will cause ingredients to be off. Stick with the metric if at all possible! Hi, i just want to crfm again. Do we bake the brownie cake first than let it cool and spread the butter cake and bake again. IN THE BROWNIE CAKE NO NEED TO ADD B.POWDER OR BAKING SODA. Hi Bee, I made it 2 batches at my first attemp. It didn’t look as pretty as yours *grin* but they brought a super heavenly taste. The whole family like it, happy with it. Now have to practice more to reach that pretty looks. Thanks for sharing. I made this for a family gathering and it was a huge hit! Thanks for the recipe! Hi, can this cake be doubled or even tripled easily? I think so but you will need to make them into separate ones. the brownie needs to be half done or fully done before you pour the butter cake batter..? I love your site though I’ve never commented. I sent this recipe to my sister and she made it on Sunday. It’s so delicious! I just had a piece now. 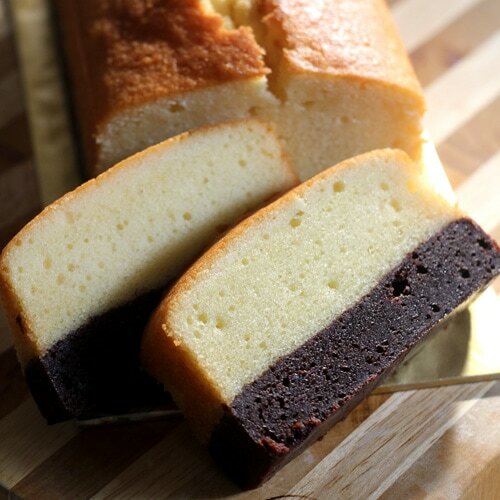 The butter cake is buttery without being greasy and the brownie is intensely rich. Full marks! Hi Jo, the recipe hasn’t changed, it’s here. You can make the chili oil from scratch by pouring hot oil to dry red chili flakes…it’s basically. Thanks Kay for trying this brownie butter cake recipe. My cake does not stick together. Wondering why? And can I mixed the both and put in the oven? I tried this, and it went well but it took forever for the middle to cook, which was incredibly frustrating….. I think if I try it again (and I probably will because I loved it anyway), I will bake it in a square pan and reduce the cooking time. I think it’ll work better, it just won’t be as thick lol! I just baked it in a $2 10inch by 4 inch loaf pan from Daiso, followed all the instructions and the result was so good I just couldn’t stop smiling. Thanks for the recipe, it’s really a cool and unusual cake! The butter loaf takes longer than 25-30 to bake!! Took mine about 45 mins!! But turned out good, thanks for sharing!!! I did the brownie butter cake yesterday and was so delicious. Thanks for the recipe!! Thank you for the recipe. The taste is divine. My only comment is that it took about 20minutes longer to have it entirely cooked. I will surely bake this cake again! Photo looked amazing. Butter cake recipe didn’t call for salt. It definitely needed salt and more sugar. I baked it for 15 extra minutes until toothpick came out clean. I would bake again and add 1/4 tsp salt and 1/4 cup more sugar. Please feel free to add salt and more sugar to suit your taste. I baked this 3 times and it came out nice and yummy and yes it took about 20 mins longer to cook it. My grandkids prefer the chocolate portion more and so this time I am going to double the chocolate. Hope it will turn out as yummy. Thank you for the recipe. Hi, I followed the recipe but when I took the brownie part out and put the butter cake part on it, the butter cake just sunk into the brownie and in the end it was liquidy and had to bake it longer. May I know how long can we keep the cake at room temperature? May I know if this cake freeze well if I am to prepare it in advance? I tried the recipe but i failed the butter cake, it looks like it contains an extra dose of butter even though I respected the ingredients. I am not sure what happened but many tried with success. I tried it today and i didn’t liked it. The brownie part is overcooked, the butter cake is too…buttery. More than one tablespoon of butter oil came out and was floating around. :( any tips? Was wondering if some of the issues stated above are because the cake batter was sitting and the butter melted and separated while waiting to be poured over the brownie…. Brownies AND butter cake?! Oh my yum! Don’t you just love recipes that look complicated but are very simple???? Definitely will make this soon, it is a drool factor 10!! (drool factor is how I judge some recipes, on a scale of 1-10 with 1 being no way and 10 being I needed a napkin)!! Your photos are great, too!! I did not like this cake at all. The brownie came out crumbly and too bitter. The butter cake was also not sweet enough. It looks pretty but flavor and texture wise just didn’t do for me. I think it would be better off making it from a boxed brownie mix and adding more sugar to the butter cake mix. I feel like I wasted ingredients on this cake! ? Michelle – I am sorry that this recipe didn’t work out for you. A lot of people tried and liked it. With so many good reviews, I’ll give this another try. The brownie portion was a tad crumbly for me as well though it held together pretty well. Although the butter cake needed more sugar, wasn’t too bad :) Will add more sugar and vanilla extract to the butter cake portion next time! I tested this recipe and I really liked it : the brownie is wondefully well chocolated. Thanks for trying out this brownie butter cake recipe. But i did run into somw trouble, so kindly correct me where i went wrong.. Waiting for ur input. Sorry for the long post! Thank u! Sorry but I really can’t advise what happened. Hmm.. alright,i understand. Thank you. i shall try again soon. I really liked the taste , m gonna give it another shot, n shall report bak. Delicious recipe Bee, worked first time with a little extra time , I cooked in a fan oven at 160*. A friend has asked if I could make a vegan version . Wondering if you or anyone else has tried a vegan version? My family loved it as the original recipe, but I might put chocolate chips in the butter cake layer , next time, for an even more decadent twist! Barbara…did you make a vegan version? I’m thinking about trying it with a flax egg just wondering if you made it and what egg replacement you used. Made this cake tonight and it turned out amazing. Fudgy brownie with soft butter cake made an out of the world combination. Thanks for sharing the recipe! Tried this brownie butter cake. I’m not an experienced baker. The cake came out as shown on your picture. The baking time was off by approx. 15 min. With my old oven. It tastes good. I will definitely bake this cake again as I like trying the unusual. Next time though, I will add vanilla to the cake mix and add a pint/approx. 1/4 tsp of salt and about 1/4 cup additional sugar. I also added a capful of kahlua liqueur to the brownie mix before putting it in the oven. The battef of both cakes are moist, of course the brownie a little dense, but the butter cake is light and moist and buttery taste. This one is a keeper and thanks for sharing! I made this cake today and I completely agree with the name ‘To die for brownie butter cake’. Even though it didn’t turn out exactly like shown in the picture as my loaf tin is a little bigger than mentioned resulting in the brownie layer being a little thinner. But the flavour wise it’s absolutely delicious!!! Can’t wait for everyone at home to try it. Will definitely be making it again.Thanks for sharing this recipe. I made this cake today and I completely agree with the name ‘To die for brownie butter cake.’ Thought mine didn’t turn out exactly like shown in the pictures because my loaf tin is a little bigger than mentioned resulting in the brownie layer being thinner. But flavour wise it’s delicious!!! Can’t wait for everyone else at home to taste it. I’ll definitely make this again. Thank you for sharing your recipe. Thanks for trying the brownie butter cake! I made this cake today and I completely agree with the name ‘To die for brownie butter cake’. Though mine didn’t turn out exactly like shown in the pictures because my loaf tin is a little bigger than mentioned resulting in the brownie layer being thinner. But flavour wise it’s delicious!!! Can’t wait for everyone at home to taste it. I’ll definitely make it again. Thank you for sharing your recipe. I made this, it was delicious! I did add vanilla and a good sized pinch of salt to each type of batter. Has anyone experience with baking the brownie and the cake at the same time? I plan on it! I’ll let you know asap! What a delicious cake recipe. I tried it last night, it was super hit in my family. Thanks for sharing such a healthy cake recipe. Thank you so much for your receipe.I must try it in home.I am not so expert in cooking but I want to surprise my family members by making this.I love their spirit who takes cooking as their passion.I think its very delicious and yummy.I cant wait anymore to make this brownie.I appriate it when someone reinventing the old recipies in a new format. Hi Bee, looks amazing us usual I want to make it as a bigger round cake – should I double all ingredients? I think you can but I am not 100% sure as I haven’t tried. I made this yesterday. The brownie flavour is excellent. They texture of mine was almost like a cross between a brownie and a chocolate shortbread. I added 1/4 tsp salt to the brownie and 1/3 tsp salt to the buttercake as a personal preference. If you’re on the fence about it. I’d say try it. It’s nice. Thanks for trying the Brownie butter cake recipe. I made it yesterday, worked well and I liked it a lot!! I had MUCH higher expectations for this “cake”. It turned out SUPER dense, and not like a cake at all. I would not recommend this at all. The brownie was the only part with flavor. I read that the first time you made this you poured the butter cake batter over the brownie layer, then the second time you piped it on. It seems both would do the same trick. Would you please clarify? Could you also let me know how to store the cake (fridge or at room temperature). How long does the cake stay moist? Yes both works but pouring is easier. Please advise the chocolate used is chocolate couverture or compound. Will these 2 types of chocolate give different brownie texture? I tried this cake.Was yummm.Brownie part was very tasty.The texture of the cake was awesome. Just to check, how long will the cake last? Thanks! I just served this to my family and it tasted SO delicious!!! The only thing was, mine was more dense and not “Starbucks’s moist” like your posted picture and so I was wondering if I either over stirred or under stirred the cake batter (the brownie layer was perfect! Hi, i made it yesterday, turn out superb yummy. My family love it and my morocco hubby love it and the cake only last 30 min on the table. LOL. 1st time baking brownie and yess it was a succesful one. Although my butter cake did not look as smooth as yours (i add in orange zest) but me and the whole family enjoy it. Thanks ? I made this yesterday and it came out perfect. Super easy to make. I added some vanilla and salt to both batters and I only had a 9×5 pan, so mine came out a little shorter & wider, but it was delicious. Like others, I did have to let mine bake quite a bit longer, but I just covered the top with foil to prevent browning & I had no problems. Thanks! Hi! The cake looks nice. I am definitely going to try it this weekend but I would like to know if I can frost it. Thanks! Hi! The cake looks nice. I am definitely going to try it this weekend but I need to know if a can frost the cake. Thanks! I plan to try this but will add glacé orange to the brownie batter and orange zest to the butter cake batter. What can we use instead of eggs..?? Yummy cake item. I love this and try at home. Thank you, Rasa. Thanks for trying this brownie butter cake. In the video it said to bake the cake part at 325 but in the recipe it said to bake at 320 which one is it? Both video and recipe say 350F. I think it will be very tricky. I won’t recommend. Thanks for sharing your recipe! I tried it today and it turned out wonderfully! My husband and I both enjoyed it! I doubled the recipe and used a ROUND 9″ wide 3″ deep springform pan and it rose about 2.75 inches high. I used 350F for both layers. next time I will remember to pipe the butter cake (probably start from the outside and spiral inwards to the center) because when I simply poured it, the weight caused the center of the brownie to sink and go up the sides! Debbie – so glad that you enjoyed this Brownie Butter Cake. can we use cocoa powder instead of chocolate? Please tell me. Your cake looks amazing. Thanks for sharing the yummy recipes with us. Love them. You can try but it may not taste as rich. I really enjoyed it, it helped me a lot, congratulations. Under brownie, 1/4 cup butter is 50g., and under Cake, 1/2 cup butter is 120g. The # gram just doesn’t seem right. It seem should be (brownie vs Cake) 50g vs 100g OR 60g vs 120g. The thing is converting cups to grams are not the most accurate. It can be 50g or 60g. Made this today but it didn’t turn out great. Although the butter cake did come out perfect, the brownie part was so chewy and thick, and it got separated from the butter cake every time I cut it. So the slice would crumble. I made this cake today for the first time and it turned out just perfect. So tasty, moist and fluffy.. my family enjoyed it. Thank you so much for the recipe? Thanks for trying this brownie butter cake!